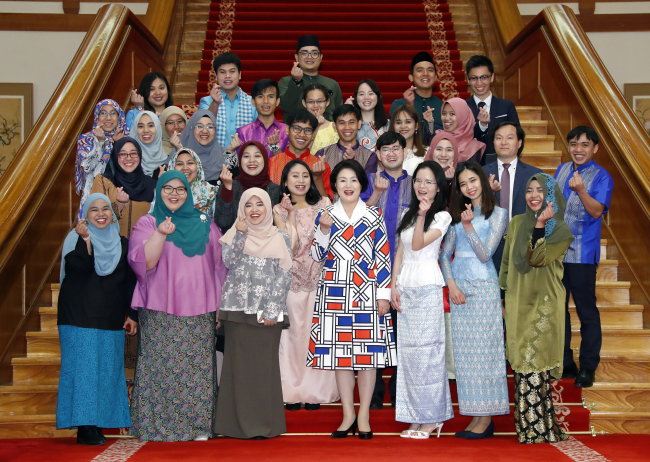 South Korea’s first lady Kim Jung-sook on Wednesday stressed the importance of the country’s relations with Brunei, Cambodia and Malaysia, at a meeting with students from the countries studying here. Cheong Wa Dae had invited 10 students each from Brunei and Malaysia and nine students from Cambodia to the presidential office. The event was held ahead of President Moon Jae-in’s official visit to the three countries from March 10 to 16. “I have heard that students from the ASEAN studying in Korea have increased in the current administration. It is a very welcome news. Relations between countries and people take deeper roots through exchanges and communication,” Kim said, going on to highlight the connection Korea has with Brunei, Cambodia and Malaysia. “In 1960, when diplomatic relations (with Malaysia) were established, it was a very difficult time for Korea. Malaysia became our partner at such a time. Friends who share friendships in difficult times last a long time,” Kim said. Kim went on to say that the Moon administration’s New South Policy aims to establish a community of peace and prosperity, and that the goal will be attainable if the students go on to become bridges that connect Korea and the ASEAN. “A country (having) relations with another country is not only a matter between governments, but the relationship between the people changes,” Kim said.